Preface. 1. Introduction: Constructive Christian Feminist Theology. 2. Foundations. 3. Revelation and Tradition. 4. Creation: Nature and Ecology. 5. Ecclesiology: Society and Politics. 6. Anthropology: The Self Sick and Healthy. 7. Theology: God So Far and Yet So Near. 8. Practice: Ethics and Spirituality. 9. Conclusion. Notes. Bibliography. Index. 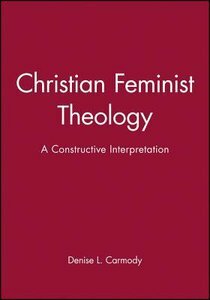 - Publisher This new introductory text constructs a Christian feminist theology, and lays out a view of the world indebted to both traditional Christian faith and recent feminist thought critical of that faith. Throughout the book Professor Carmody weaves back and forth, trying to develop a conversation stimulating for both partners. Christians, she suggests, need to reconsider their traditional categories for dealing with God, nature, the self, and human community, under the challenge of feminists who find such categories inadequate and even destructive. And feminists need to stay in touch with the perennial questions of being, sin, grace, sacramentality, and the like, which have found some truly profound answers in the history of Christian theological speculation. The book will be suitable for undergraduate college or university students, and presupposes no background in theology. This new introductory text constructs a Christian feminist theology, and lays out a view of the world indebted to both traditional Christian faith and recent feminist thought critical of that faith. Throughout the book Professor Carmody weaves back and forth, trying to develop a conversation stimulating for both partners. Christians, she suggests, need to reconsider their traditional categories for dealing with God, nature, the self, and human community, under the challenge of feminists who find such categories inadequate and even destructive. And feminists need to stay in touch with the perennial questions of being, sin, grace, sacramentality, and the like, which have found some truly profound answers in the history of Christian theological speculation. The book will be suitable for undergraduate college or university students, and presupposes no background in theology.